Soak the beans, rinse thoroughly and put into pot with 3 cups water. Blend together 1 cup water, the onion, garlic and carrot. Once blended until smooth add the cayenne pepper and ginger. 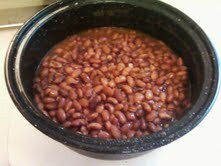 Pour over the beans and simmer 3 hours. When beans are done add the salt, honey and salsa and continue to simmer for another hour or until you are ready to serve. Delicious!! Great to hear that you are now able to cook in your GSO without concern. Continual cooking and periodic cleaning with dish soap will keep your oven smelling proper and keep your interior nice and clean from here on out. I am glad to see you try out dry beans, solar cookers are great for that. Thanks for sharing your successes as well as your "not so successful" experiences.